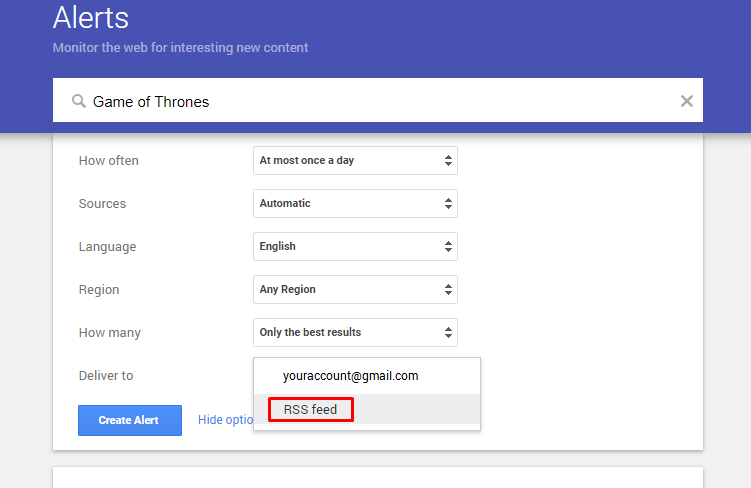 How to generate a Google Alert RSS feed? 1. Go to Google Alerts service (https: //www.google.com/alerts). 2. Enter your search keyword, a topic of interest, or any other search term. 3. Then click “Show options”. Make needed settings, like language and region. 4. In "Deliver to" option select "RSS feed". 6. Find your new Alert in the list. Click on the RSS icon. 7. Use this RSS feed in any RSS Ground tool. As soon as new content appears in your Google Alert RSS Ground will post it to your social media account or blog, or display it in your content widgets. Or you can follow or recent updates in your Feeds Reader. What is a custom feed and how to use it?